Could it be Oak, the long lost Wood Turtle? Saturday Kathryn and Eric were on their way to check out a garage sale and they discovered a male wood turtle crossing the road about ½ mile from our house. 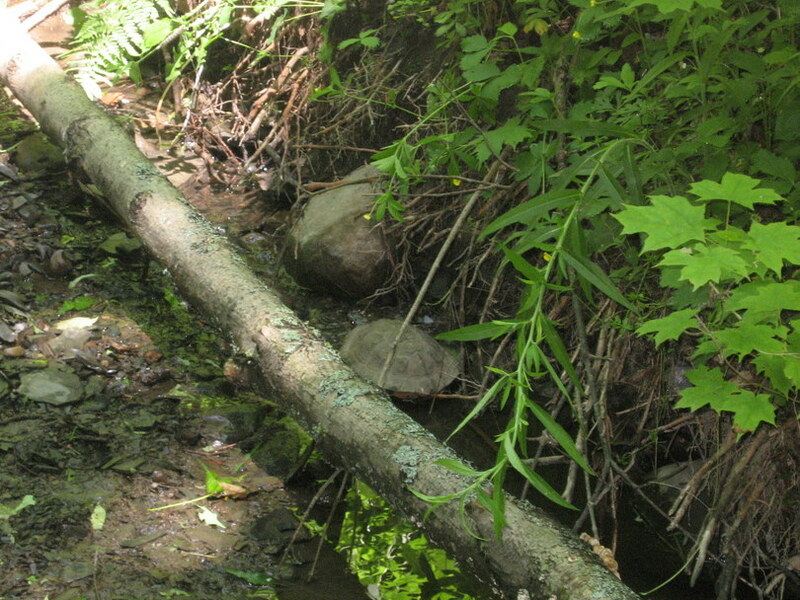 Kathryn recovered the turtle, we took some pictures, and we relocated the turtle to a woodland stream environment. This turtle may have come with a story, but first some background on Wood Turtles. Wood Turtles live in a relatively small area of eastern Canada and the northeastern United States.Within this range, this turtle is generally uncommon to rare and spottily distributed. 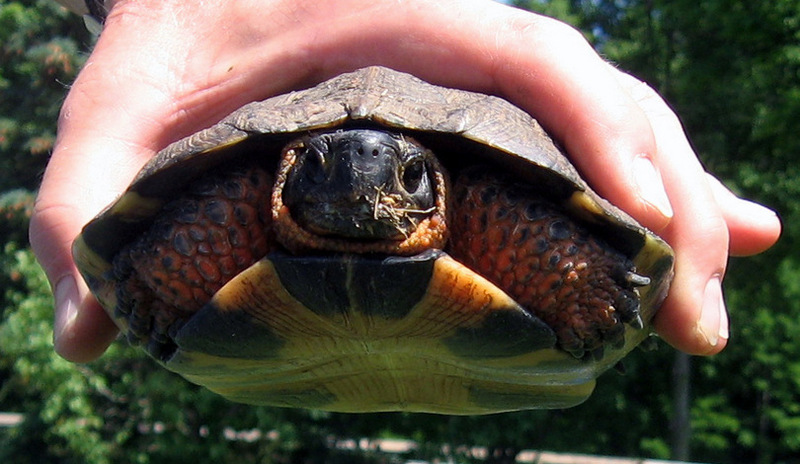 The NYS Department of Environmental Conservation lists wood turtles as a Species of Special Concern. Wood Turtles are usually found in association with moving water.Wood turtles are described as a woodland species, but in some places they thrive in a mosaic habitat of riparian woods, shrub or berry thickets, swamps, and open, grassy areas.Wood turtles are active from late April until late October when they burrows in mud or near some underwater structure during hibernation.Their diet includes wild berries, mushrooms, dandelions, and many other plants are eaten; while earthworms, insects, mollusks, and carrion comprises the carnivorous portion of their diet. 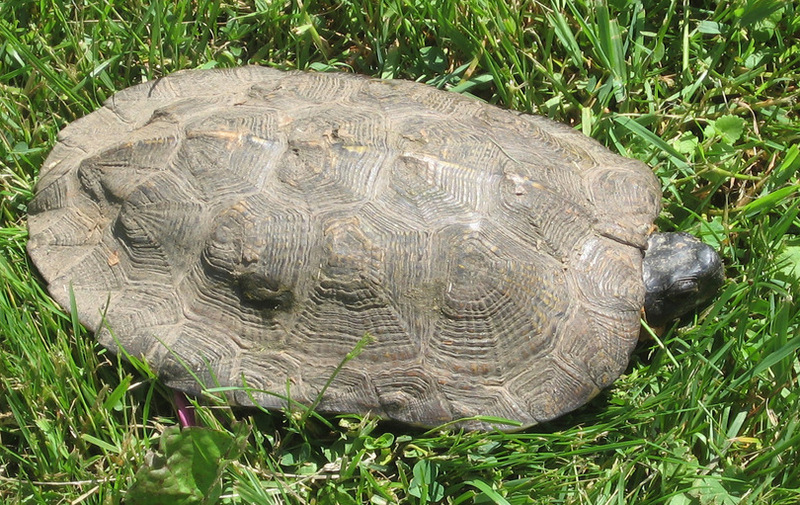 In an earlier phase of her life my sister Barbara had several turtles and tortoises including 3 wood turtles: two males (Moss and Oak) and a female (Trillium). Upon her divorce in 1981 Barbara dispersed her turtles and brought her Wood Turtles back to NYS. The winter of their return they the three wood turtles stayed with Kathryn and I as Barbara sorted out her living arrangements. Fortunately during the winter the turtles were in a semi-hibernation state and while they were active they did not poop – the perfect pet. In the spring of 1982 I built an outside pen for the 3 turtles. Unfortunately, Moss was the dominant male and constantly chased Oak, when he wasn’t chasing Trillium. Finally, Oak had enough and climbed the 4’ fence to escape. We never saw him again. My sister thinks she first got her wood turtles around 1975 to 1977, which of course is 30 years ago. At this point Oak would now be in his fifties. If this turtle is Oak, he looks pretty good especially for a “more mature gentleman”. We relocated Oak (we think) to a woodland stream habitat more suitable than our paved road.